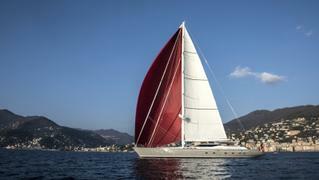 The 35 metre sailing yacht Caroline 1, listed for sale by Simon Turner at Iconovista, has been sold with Sea Alliance introducing the buyer. Built in aluminium, Caroline 1 was the fourth Dubois design built by Alloy Yachts when she was launched in 1994 and recieved a major refit in 2013. She combines good sailing performance with a versatile layout and has a light and airy maple interior by Redman Whiteley Dixon accommodating eight guests in four cabins. These comprise a master suite, VIP suite, and two twins, all with en-suite shower facilities. The upper saloon is entered through compressed air operated sliding doors to reveal a guest bar to port including a coffee machine, fridge, ice maker and sink. To starboard is the upper dining and seating area for eight guests providing uninterrupted views across the water. Stepping down into the lower saloon, guests enter a luxurious area offering two seating areas and great views aft. This area also includes a large multimedia television screen and video library. Outdoors, the main cockpit has two large seating areas including a dining space for eight guests. The whole cockpit can be fully enclosed to protect guests on chillier days or fully opened to enjoy more balmy weather. An extensive sail wardrobe facilitates fast and comfortable passage making and auxiliary power is provided by a 540hp Lugger diesel engine. Caroline 1 was asking €3,950,000.